Notes for the Archive Project. Day Three. Desire (verb): early 13c., from Old French desirrer (12c.) "wish, desire, long for," from Latin desiderare "long for, wish for; demand, expect," original sense perhaps "await what the stars will bring," from the phrase de sidere "from the stars," from sidus (genitive sideris) "heavenly body, star, constellation" Related: Desired; desiring. You can see it in her eyes—the intensity, a white heat, an internal smoldering. The childhood she drug with her all the way from California—a darkness unfathomable, preverbal. Primal, before words or language. So much so it becomes its own warped language. Residing inside the body, using the body as its form of language. Starving and later, her use of methamphetamine, winnowing herself, that body, down to nearly nothing and cutting off all her long dark hair, bleaching it. Snuffing out desire, ours and hers, by neutering the body and by neutralizing the mind vis a vis starvation. In the photograph, she stars directly into the camera as if daring the cameraman--to continue filming and taking her in. It is a kind of nourishment, the camera, how it devours her; how we devour her (her image) by way of the photograph; the way one stares at another, taking that person's aura in. And those eyes—animal like—huge like a child, starving. And the sorrow in them. It is a contradiction: she is in the Factory, with Warhol, in New York City, a Warhol Superstar. 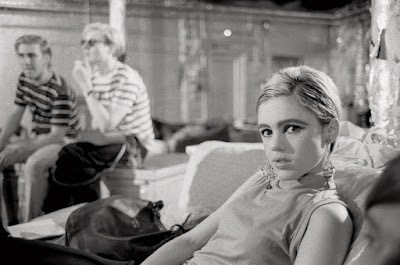 In other words, she is at the beginning but at the same time this beginning is also an end: the death of who she was before she made herself into "Edie Sedgwick" and, presumably, the death of her past, of her terrible childhood and family; the end of California. But it isn't. In fact, that fire, that nightmare, is what lives within her--as desire, as the fire that threatens to swallow her whole. If desire is a wish, an unfulfilled need, what was it she was hoping to glean from the Factory? But, no , that question is wrong. Of course she knew—she was drawn to it—the scorch, the burn. She went there racing after it—the way one runs after the archive--knowing it would destroy her. Desire works that way—it draws us into it, then it puts us out.